Obviously, it's a reference to , boss from . To complete this achievement you will need to summon Der Loa'rer aus den Tiefen during the Stormwall Blockade boss fight. You don’t need to defeat the Lurker. To summon Der Loa'rer aus den Tiefen you need to click on a fish pool to the left of the docks after the boss has been engaged. Ideally you want only one player staying behind on the docks to summon it. That player will have to deal with a few mechanics for 2 minutes. After clicking on the pool, the player will start pulling a rope out of the water, and they will start to slowly get pulled towards the water. Walk in the opposite direction to stay on the docks, but don’t walk too far away from the edge or the rope will break. Shortly after, sea swells will start falling on the player, who will have to dodge them to stay alive. To deal with De Lurker Be’loa, you can have a Warlock cast Furcht on it every 20 seconds. If you don't have a Warlock then you can use a Rogue to stun the Hydroschlag or just make a cc rotation. A quick tip: The lurker can blast people off the platform if he does his Hydroschlag the moment people arrive on the main platform. You'll want a class with high mobility to grab the fishing line. The lurker needs to be spawned in before both brother and sister die, or the rope will automatically be dropped. You also can't run too far from the puddle, or it'll break from range. The first Hydroschlag is the most deadly as it can hit players porting over from the ships. It should be stunned by the person who fished the add up or baited away from the middle of the room. We had our rogue sit on the lurker the entirety of phase 2 to stun every Hydroschlag. The rest of us did the fight normally, but our stacking was super sloppy with the pull effect from Tiefensog. As long as your group clears the puddles well it should still be pretty manageable. The "fishing" requires you to interact with the pool when the fight begins. Stay alive for a 120 second channel and you will spawn De Lurker Be'loa. Do not stand near the edge of the platform, the rope tether will slowly pull you off. Stay in square area of the boss room. 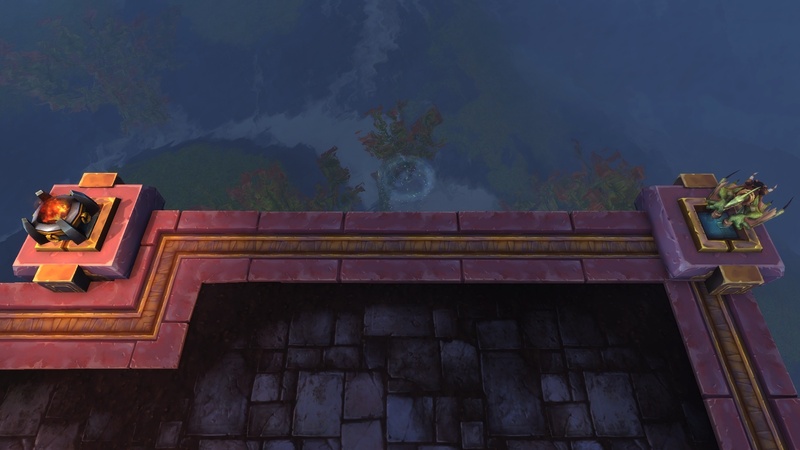 Running over to the entrance where the platform gets narrower will de-spawn the pool. Swirlys and tidal waves will shoot out from the pool. Just avoid them. The lurker has a very small hitbox and chances are there will be Freezing Tidepools everywhere discouraging melee abilities. An outlaw's ranged stun will be most reliable to interrupt Hydro Blast. Undertow is an instant kill if you get within range, however is also interruptable. The person fishing up the Lurker can be anyone. Mobility is unnecessary. The hardest part is the wave phase since they'll knock your character towards the direction your character's back is facing. The trick is get hit by a wave, get knocked back, spin your character 180, get knocked back to your start location, repeat for each wave. It completely trivializes the wave phase. I just did this with a pug group at 3/19/19. I just wanna add there that besides the fear from warlocks and stun cc from rogues/etc that you can use on the lurker, you can also use the hunter’s freeze trap as cc. This creature is categorized as “Not Specified” so any other cc that has specific targets won’t work such as banish or hibernate. Also, make sure no one is breaking the cc, it should be obvious but it’s a common mistake. I was doing tab targeting initially so unknowingly I was breaking the cc repeatedly so I had to target and click manually between the adds and the boss. Besiegt die Sturmwallblockade auf dem Schwierigkeitsgrad 'Normal' oder höher, nachdem Ihr den Loa'rer aus den Tiefen geangelt habt.